Wow! Debbi did it again didn't she? 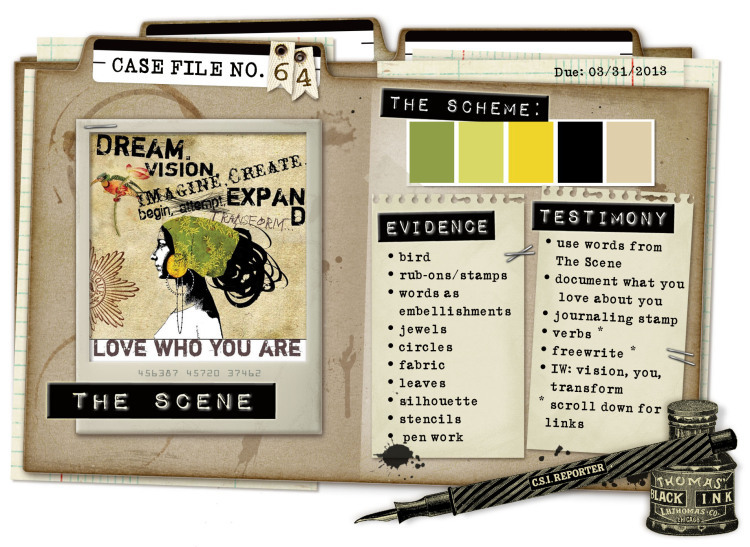 CSI stands for Colour, Stories, Inspiration and this definitely has all three covered. The Scene is an inspirational image from which Debbi pulls the Scheme, the Evidence and the Testimony. There is also a set of CSI Coordinates designed by Michele Singh to help CSI members solve the case - these are printable pp, journaling spots and images and they're brilliant! Here's my solution, with a school photo of me at about seven years old. The Evidence: bird; rub ons; words as embellishments; jewels; circles; leaves; pen work. The Testimony: from the scene "love who you are"; what you love about you ; IW "you". This little girl didn't love anything about herself - this is me finally giving her a hug.